One day I found out error messages as below, I don't know what happened, what is a solution to check for fixing, and I need help from you. Eventually, I realize that my error instance is "The following signatures couldn't be verified because the public key is not available: NO_PUBKEY......."
Follow this answer to remove all the GPG error. Then follow this answer to automatically remove all the 404 Not found PPA's. scroll down and select "Advanced"
now select "Try to import all missing GPG keys" and click OK. This might take a minute or two. you'll get a notification when it's done. p.s: problem seems to be related to this bug. Not the answer you're looking for? Browse other questions tagged apt ppa gnupg or ask your own question. 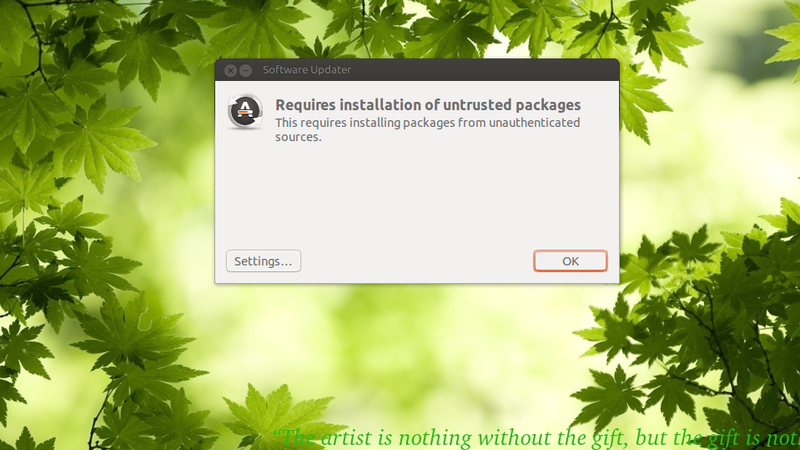 Is there a way to upgrade from 16.04 to 18.04 using unauthenticated files?